FREMONT, Calif., Sept. 27, 2018 (GLOBE NEWSWIRE) — Aehr Test Systems (NASDAQ: AEHR), a worldwide supplier of semiconductor test and burn-in equipment, today announced financial results for its first quarter of fiscal 2019 ended August 31, 2018. Net sales were $4.7 million, compared to $7.0 million in the first quarter of fiscal 2018. GAAP net loss was $1.5 million, or $0.07 per diluted share, compared to GAAP net income of $10,000, or $0.00 per diluted share, in the first quarter of fiscal 2018. Non-GAAP net loss, which excludes the impact of stock-based compensation expense, was $1.3 million, or $0.06 per diluted share, compared to non-GAAP net income of $226,000, or $0.01 per diluted share, in the first quarter of fiscal 2018. Backlog as of August 31, 2018 was $6.1 million. Successfully installed initial production FOX-XP™ system to new customer for test and burn-in of integrated silicon photonics devices for data communications applications using Aehr’s proprietary DiePak® carriers, which allow single socketing for both functional test and burn-in of their singulated bare die. Completed shipment and acceptance on initial order for new DiePak carrier design from Aehr’s FOX-XP lead customer for a next-generation sensor device expected to ramp later this fiscal year using their installed base of FOX-XP test and burn-in systems. Booked $1.8 million during the quarter for WaferPak™ and DiePak full-wafer and singulated die/module contactors for use on Aehr’s installed base of FOX test and burn-in systems. Delivered ABTS™ Test and Burn-in System to a new customer for use in military and aerospace packaged part qualification and production burn-in. Delivered follow-on ABTS Test and Burn-in System to a wireless communications chipset company for use in production burn-in of automotive devices. Announced today a $2.7 million follow-on order from one of the company’s lead FOX-XP Test and Burn-in System customers for a FOX- XP Multi-Wafer Test and Burn-in System and WaferPak Aligner to provide additional test capacity for the customer’s increasing silicon photonics device production requirements. “Our revenue in the first quarter was lower on a year-over-year basis with many of our customers’ capacity ramps expected later in our fiscal year. Our first quarter revenue and bottom line reflect the impact of two key shipments anticipated near quarter end that pushed into the second quarter. The revenue from these two shipments will now show up in our second quarter, which ends November 30. We continue to see our customers forecasting the need for additional volume capacity by the end of our current fiscal year that ends in May 2019, with a heavy concentration of shipments in the second half of our fiscal year. “Today we are pleased to announce another production order from our lead customer for our FOX-XP system for production wafer level burn-in of silicon photonics devices. This customer continues to increase their capacity and is also forecasting orders for delivery of a significant number of WaferPak Contactors by the end of this fiscal year to meet this capacity. They are also forecasting additional capacity for FOX-XP systems and WaferPak Contactors throughout calendar year 2019 and beyond. We now have two lead customers ramping their production capacity for Silicon Photonics devices using our FOX-XP system, and we see this market as a significant and growing opportunity for our solutions over at least the next several years. “Our program with our lead customer using the FOX-XP system for testing singulated die/modules for mobile device sensors with our DiePak Carriers continues to move forward. We completed the initial qualification and acceptance of the new DiePak and production test program for a new device and we are expecting them to add capacity for our DiePak Carriers during this fiscal year as this new product ramps into production. We continue to work with this customer on other applications and believe we are well positioned to win additional applications for wafer level and singulated die/module test and burn-in of sensors they produce. “While we are pleased with the strong forecast for increased capacity that we are seeing from multiple customers and programs in calendar year 2019, one of the new programs at our lead FOX-XP customer that we anticipated to begin volume shipments in our fiscal second half has pushed out a few months. The impact of this shift is that we now expect our fiscal 2019 revenue to be in the range of $30 million to $35 million. Our GAAP profit range is expected to be between break-even and $2.5 million, including the investments we are making in manufacturing operations, sales, and marketing. Even with the push out of this customer program, we expect to have a significant increase in bookings and backlog year over year in fiscal 2019. 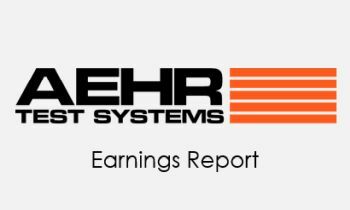 Aehr Test Systems will host a conference call and webcast today at 5:00 p.m. Eastern (2:00 p.m. PT) to discuss its first quarter fiscal 2019 operating results. To access the call dial 800-458-4121 (+1 323-794-2093 outside the United States) and give the participant pass code 6249614. In addition, a live and archived webcast of the conference call will be available over the Internet at www.aehr.com in the Investor Relations section. A replay of the conference call will also be available via telephone beginning approximately two hours after conclusion of the call through 8:00 p.m. ET on October 4, 2018. To access the replay dial-in information, please click here.